An unusual day this so-called spring is one in which it doesn’t rain. My 94-year old mother uses a Dial-a-Ride scheme to get into town and the driver on her last trip observed, rather wittily I thought, that this was the wettest drought he’d ever known. A pleasant day is one of the aforementioned unusual days on which the sun deigns to put in a few brief appearances between the continuing rather heavy cloud cover. A good day is one of those rare pleasant days in which the temperature staggers up to something approaching the seasonal norm, say 16°C or so. Today met my good day parameters so we decided to go Odo hunting in the hope that they, too, would think it worth emerging. About 20kms/13mls away is Marston Vale’s Forest Centre complete with a wetland reserve looking like a decent dragonfly hang out. It’s relatively new and certainly new to us so we went for our first exploration. Happily, on entering the wetland area, we met a fellow nature enthusiast who shepherded us around a few likely spots to get us started. He did, however, preface this by saying that he hadn’t potted any Odos during his visit. After he left us, expecting the worst we nonetheless continued, largely for the exercise and familiarization. We continued to draw a blank until, in a sheltered spot about half way around the main lake, Carol caused someone to flutter up from the grass. 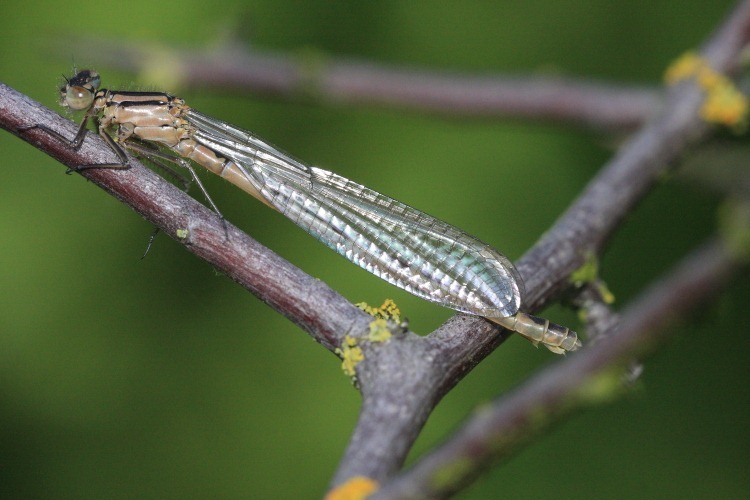 It eventually settled on a hawthorn bush and was undoubtedly a damselfly. Not the most accessible of locations but I managed to get there without shaking its perch too many times. I was expecting to end up focussing on another Large Red (Pyrrhosoma nymphula). As my camera came into focus this was clearly not a Large Red. The old recognition skills get a bit rusty over winter [Ed: in this bloody weather, everything gets rusty.] so I was initially undecided as to whether this was an Azure or a Common Blue. I was pretty sure it was the latter but I’d heard no reports of any yet this season. 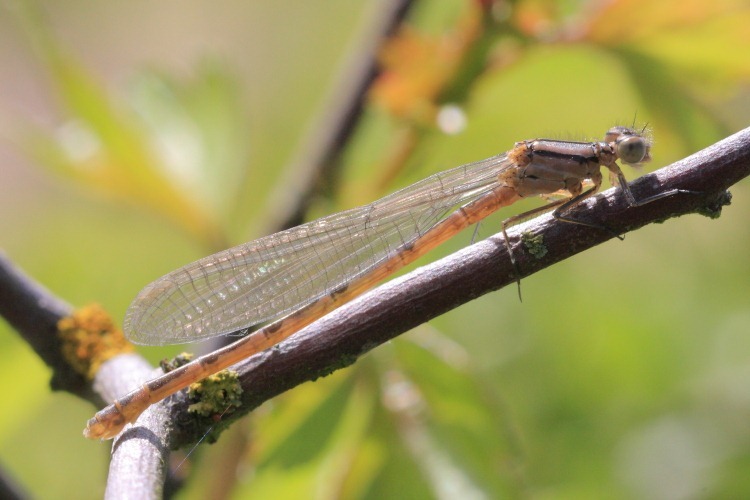 A quick look in Dijkstra/Lewington back at home base confirmed my suspicions, it was indeed a female Common Blue Damselfly (Enallagma cyathigerum), newly emerged. I’ve included the second contre-jour shot because you appear to be able to see clear through the backlit abdomen and what appears to be the empty gut inside. Curious picture. Further along the track we did disturb about five Large Reds but none of them settled appropriately for the camera. 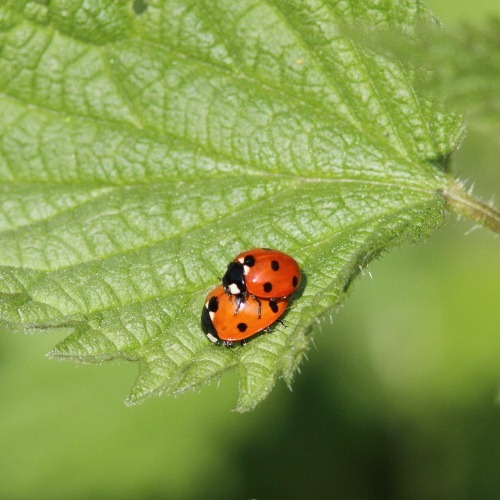 More cooperative, particularly with each other, was a pair of 7-spot Ladybirds (Coccinella septempunctata) who seemed to be concentrating on making more ladybirds. 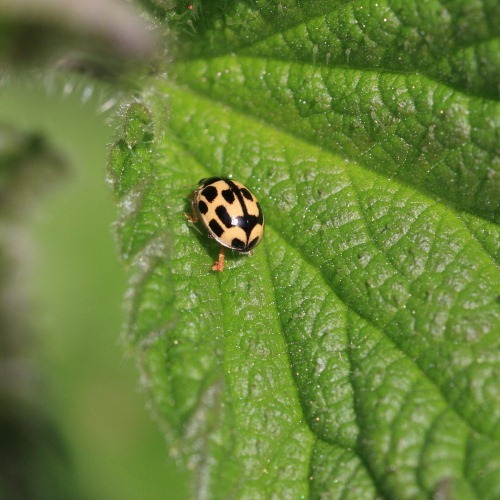 Further along but having a little less fun by itself, though sporting the same number of spots as the previous couple, was a 14-spot Ladybird (Propylea quatuordecimpunctata). 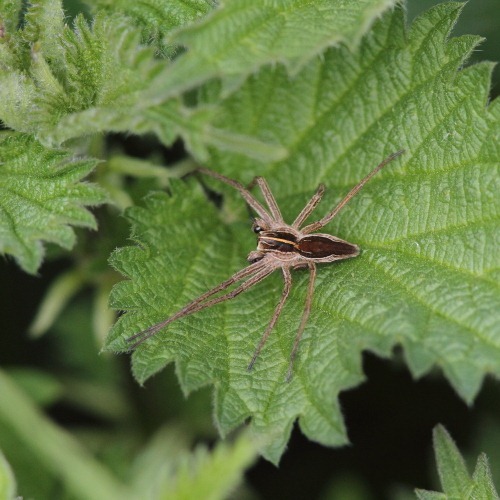 Hunts in nettle beds and other dense vegetation. Sunbathes on leaves with front two legs on each side extending forward and very close together. We did see another Common Blue female, so I think the weather had brought, or was bringing, them out. They’re going to be in for a bit of a shock before the weekend gets here, though, if the forecast is accurate (and when it’s bad, it usually is accurate).